Monocle of Terror: Bargain Dummies... of Death! 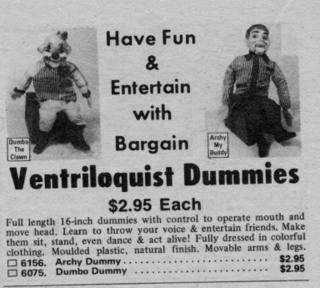 Make no mistake my young friends, these "bargain" dummies are not fun or entertaining. They are a freak show waiting to nail your childs head to the floor. While Slappy does approve of their fear inducing nailings, he does not approve of their limited intelligence and lack of wit. These bargain nightmares, once alone in your home, will fly up and down your hallways in a most furious manner, knocking books off tables and eating all the food in your refridgerator. What sort of evil is that? It lacks creative thinking and Slappy will tell you they are easier to foil than a blind man in a tickling contest. Just remember that when you think of bringing these beasties into your home. Also remember that if you do accept responsibility for these dummies, Slappy will be coming over everynight, not only to torment you but to beat the hell out of your dummies. 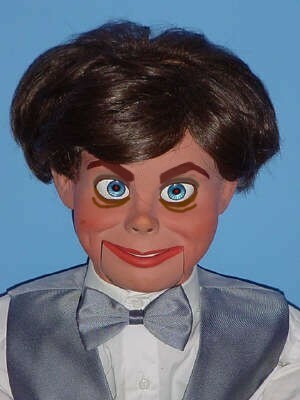 And you don't want Slappy and the evil he brings destroying your home every night. Slappy, I take it these bargain dummies are an inferior product then? I will call immediately and cancel my order. I was fooled once again. A clown Ventriloquist dummy?? That is way evil. Anything named Archy can not possibly be evil enough for me. Monkey, how many times have I told you not to order things like this? Oh sweet little insane minion, what ever shall I do with you? Never underestimate the evil of the Archy dummy. It is in league with the clown dummy, and as Calzone said, that is way evil. Me? I just stick my hand up there arses and they calm down, nothing like a hand up your arse to settle you into a more maleable frame of mind...especially without the ol' KY not even vasoline! I am Slappy. Member of the Midnight Anarchists and Ventriloquists Society since 1863. Favorite job - selling medicinal elixir with my beloved Dr. Charlatan. Worst master - that imbecile, Professor Lockjaw. Favorite Disguise Kit - President Chester A. Arthur. Most obnoxious patron - that cretin John Wilkes Booth. Favorite way to taunt humans- wordlessly opening and closing my mouth as my eyes slowly turn towards you.